Seas the Day is located in a luxury, gated community at Carolina Beach, NC (20 minutes from Wilmington). This multi-level condo has both a private elevator and its own garage. This beautiful unit features 3 bedrooms, 3 and ½ bathrooms, granite countertops, stainless appliances, hardwood floors in the living areas, tile baths, custom cabinets, coffered ceilings and crown molding. All beds have hypoallergenic top protection with double mattress covers/pads on them. All beds and mattresses are new 2018. The living room has a large 65” Smart TV and a leather sofa with 3 power recliners. Seating for 6 or 7 at the kitchen table includes 4 chairs and a bench with additional seating using the 4 kitchen bar stools. The kitchen is well appointed included a coffee maker, 4 slice wide toaster, blender, spice rack, hand mixer, pots/pans and many fun little extras. All of the bedrooms have large flat screen HD smart TV's and we provide WiFi throughout and a DVD player. Relax by the community pool with outdoor kitchen/grill or walk to the ocean just across the street. Enjoy both lake and ocean views from the condo, just steps away from the boardwalk, and many restaurants. Watch “Movies at the Lake” from your balcony. Carolina Beach Lake (across the street) also offers a Farmers Market on Saturdays, paddle boat rentals, kayaks, a playground and walking trail. We have parking passes for 2 cars; we provide 2 beach chairs, some beach toys and games and 2 carts to haul everything to the beach. Private elevator accessible from garage is very handy for suitcases, groceries and people. There is a hose conveniently located in the garage to rinse off before going up to the condo. Pleasure Island: We are a little island but with lots of fun things to do: the NC Aquarium, Fort Fisher Civil War museum, two boardwalks, two fishing piers, Britts Donuts (an institution since 1939), Krazy Kones ice cream on the Boardwalk, Squigley's Ice Cream Shop (you've been squiggled!) across the street, and Freeman Park - where you can drive out and camp right on the beach. We offer free live bands, bingo, an assortment of carnival rides, and Thursday night fireworks during the summer right on the boardwalk (you can see them from a balcony or watch from the community pool to avoid any crowds), and of course have some delicious seafood restaurants. Park your car and walk to everything. 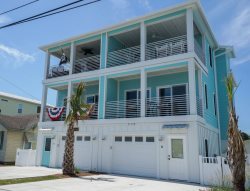 You don’t have to worry about getting stuck in beach traffic with the beach access right across the street. If you do want to take a drive, it’s a short drive to Fort Fisher, the Southport Ferry, the Aquarium, the State Park and a short 20 minute drive on one road takes you directly to downtown Wilmington and the beautiful River Walk with wonderful shops and restaurants. There are two golf courses within 5 miles and many more in the area. Everything you need you can find on the island: grocery stores, liquor stores, hardware stores, department stores, beachwear stores, etc. Many are within walking distance. What more could you want! You can book your reservation right from our website or if you prefer, give us a call and we'll be glad to help make your vacation a special one. You all are great to work with and timely responses to inquiries is outstanding! Great location in Carolina Beach. The condo is well maintained and had all we needed for our stay.